Genoa salami, ham, Cotto salami, pepperoni, provolone and mozzarella cheeses. Ham, turkey, roast beef, provolone and mozzarella cheeses. Ham, turkey, roast beef and feta cheese. Marinated chicken tenderloin on a bed of lettuce with tomatoes and cucumbers. A tender grilled salmon fillet marinated with our special seasonings and served on our large tossed salad. Our juicy rib eye steak served on our large tossed salad with shredded mozzarella cheese. Served on a bed of lettuce with tomatoes, cucumbers and your choice of dressing. Crispy strips of fried chicken tenderloin chopped and served on a bed of lettuce with tomatoes and cucumbers. A traditional Greek salad of lettuce, tomatoes, cucumbers, feta cheese, kalamata olives, Greek pepperoncini and served with our famous homemade house dressing. A traditional Caesar salad of romaine lettuce, seasoned croutons and shredded Parmesan cheese served with our robust Caesar dressing. 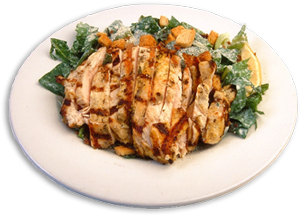 Served with garlic bread and choice of Greek salad, Caesar salad or soup. Three crepe-style pasta tubes stuffed with ricotta, Parmesan and mozzarella cheeses. Grilled chicken tenderloin baked with diced tomatoes, fresh basil and mozzarella cheese drizzled with our garlic infused herbed olive oil. Baked chicken tenderloin, spinach, garlic and parmesan, covered with mozzarella and creamy alfredo sauce. A great combination of all things Italian: lasagna, manicotti, Italian sausage, stuffed shells and Italian meatballs. Breaded eggplant cutlets layered with ricotta. Covered with marinara sauce and mozzarella and baked until golden. Served with a side Greek salad, pita bread with tzatziki sauce, and your choice of rice pilaf, greek potatoes, french fries or steamed vegetables in garlic butter. 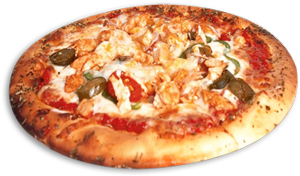 Our dough is made fresh daily and each pizza is topped with our special blend of cheeses and homemade pizza sauce. Any regular toppings on a 7 inch Greek pita bread. Our strombolis are made with mozzarella cheese and meat sauce and baked golden brown. Grilled onions, green peppers and mushrooms. Grilled chicken, onions, mushrooms and green peppers with marinara sauce. Marinara sauce, grilled onions, green peppers, mushrooms, black olives, diced tomatoes and feta cheese. Marinara sauce, spinach and feta cheese. All calzones are made with marinara sauce, mozzarella and ricotta cheeses. The original fast food! A Grecian delight – tender beef and lamb combined with Greek spices, browned and served on a pita with lettuce, tomatoes, onions and homemade tzatziki sauce. The most tender part of the chicken breast marinated in our special blend of spices. Grilled and served on pita bread with lettuce, tomatoes, onions and homemade tzatziki sauce. Pork tenderloin marinated with traditional Greek spices and grilled to perfection. Served on pita bread with lettuce, tomatoes, onions and homemade tzatziki sauce. Juicy philly steak with grilled peppers, onions, mushrooms and provolone cheese on pita bread. Grilled peppers, onions, mushrooms, tomatoes, black olives and provolone cheese on pita bread. Our homemade white tuna salad with mayonnaise, lettuce, tomatoes and onions on pita bread. All served with mayonnaise, lettuce, tomatoes, onions and provolone cheese on a New York kaiser roll. tomatoes and onions on a New York kaiser roll with french fries and a pickle spear. Served on a 8-inch hoagie roll with potato chips and a pickle spear. Oven-baked with our homemade meat sauce and melted mozzarella cheese. tomatoes, onions, provolone cheese and our homemade house dressing. Menu items and their prices are subject to change at any time.